Question : Who can become members of IRWO? Answer : Membership of IRWO is always open provided the applicant fulfills the following eligibility criteria. 1. Serving railway personnel, except those on deputation with railways, having at least two years of continuous service. 2. Retired railway personnel, who have retired after at least 20 years of service in railway except those who retired on disciplinary grounds. 3. Railway personnel who ceased to be in service on medical grounds before rendering 20 years of continuous service. 4. Personnel of co-operative societies/banks working for railways only. 5. Spouses of deceased railway employees. The above eligibility conditions apply to employees of railway PSUs and IRWO also. Application Form is available in the General Rules Booklet. Since the Application Forms are pre-numbered, photo copies of application forms are not accepted. Membership Fee at present is Rs. 1000 only. There is only one type of Membership. A Member may apply for any type of dwelling unit in the scheme irrespective of his emoluments or grade in which he is working. Question : Can a non-railway employee become a Member of IRWO ? Question : How to become a member of IRWO ? Answer : One can become a Member by applying in the proper form contained in IRWO General Rules, October 2007. A copy of the General Rules may be obtained on payment of Rs.100 in cash or Demand Draft Payable to IRWO at New Delhi from Administrative Office, Indian Railway Welfare Organisation, Railway Office Complex, Shivaji Bridge, Behind Shankar Market, New Delhi 100 001. Question : What are the different types of membership ? Answer : There is only one type of Membership. Any Member can apply for any type of dwelling unit, irrespective of emoluments. Question : Can I apply for a house without becoming a member of IRWO ? Question : Is the membership fee refundable if I withdraw my membership ? Question : Can husband and wife both become members if both are railway employees ? Answer : Yes. However, for schemes located in the same city they will be treated as a single Member. 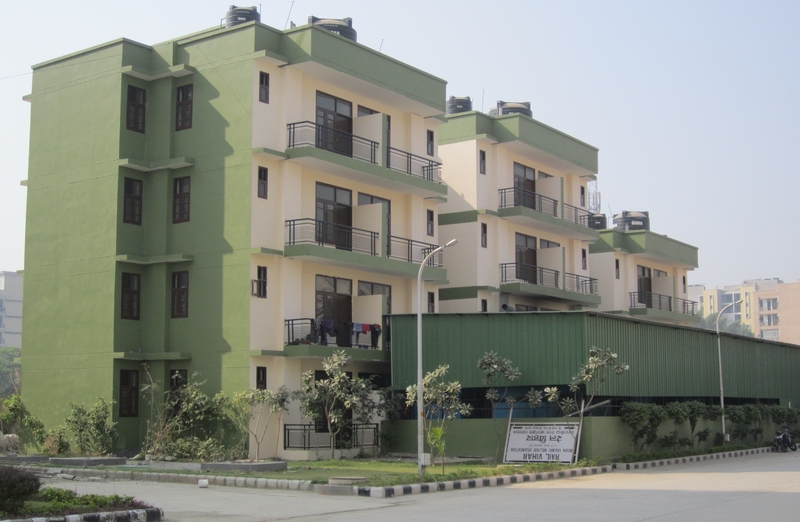 Question : What are the different types of houses built by IRWO ? The areas and other specifications, however, may vary depending upon cost and the need of the situation. Question : How can I apply for a IRWO house ? Answer : One can apply for a house through the application form contained in the Project Brochure. When a scheme is ready for application wide publicity is given through news papers, this website and through IRWO Samachar Darshan. Project Brochure can be downloaded from the Web Site. Question : Can I get more than one IRWO house ? Answer : Yes. But only if a first time applicant is not waiting. Question : Can I change my option from one place to another after participating in the Demand survey ? Answer : Yes, provided the plan for the scheme has not been submitted to the civic authorities for approval at any of the two concerned places. Question : Can I change my option from one type of house to another type of house ? Answer : Yes, provided the plan for the scheme has been submitted to the civic authorities for approvals. Question : Can I exchange my house with the house of another member ? Answer : Yes, provided both the allottees have cleared all the dues. Question : If a house is already allotted to me by IRWO, can I purchase another IRWO house in my name or in the name of my children from some other Member ? Question : To whom can I sell my house ? However , Please check the latest General Rules on this subject which is available on the Web Site. Question : What are the formalities to be followed for the sale or purchase of an IRWO house? Answer: Please consult IRWO General Rules, October 2007, as amended from time to time. Question : Who can be a co-owner of an IRWO house? Answer: The Parents, spouse, children, grand children, adopted children, brothers and sisters of the Member may be made a co-owner of the house. Question : How to become a co-Owner ? Answer: Coowner can be made by submitting application in prescribed forms along with photo of the co-owner duly attested, signature of the co-owner and processing fee as decided from time to time. No processing fee is charged for making the spouse as co-owner. Question : What is a Conveyance Deed? Answer: Conveyance Deed is a legal document establishing ownership rights on the property. It is required to be executed before the revenue authorities on stamp paper of appropriate value. In case of IRWO houses, it is executed between the allottee and IRWO representative specifically authorised by IRWO to do so. Question: Do I need to execute a conveyance deed/register my house before applying for an NOC for its transfer? Answer: Transfer of any property is basically governed and controlled by three Acts, the Transfer of Property Act, 1882, the Registration Act, 1908, and the Indian Contract Act, 1872, apart from the Stamp Act. If a transfer of immovable property is inconsistent with or contrary to any of the provisions of any of the three Acts mentioned, the transfer may be void or voidable. Accordingly, sale of an immovable property must be completed only by a deed duly registered except in case of an immovable property which is of the value of less than Rs. 100/-. As such, it is mandatory for an allottee to execute a conveyance deed/register his/her house before applying for an NOC to IRWO. Further, he has to submit a copy of the registered sale deed, after the transaction, to IRWO within a specified period to incorporate the change in IRWO's records. Question : How do I execute a Conveyance Deed ? Answer. The allottee is required to submit an application to IRWO in the prescribed Form along with a fee of Rs.500 only. IRWO will then issue an authority giving the details of the property for use by the revenue authority. The allottee will then meet the authorized representative of IRWO who will put him in touch with a legal person who will further guide him in the matter. The allottee may avail the services of any other legal person as may suit him. Question : Can I withdraw from a scheme? Answer : Please consult Withdrawal Rules given in IRWO General Rules, October 2007,as amended from time to time. Question : What are delayed payment charges ? Answer : Delayed payment charges are charges levied for delay in payment of installments after a grace period of seven days. At present the delayed payment charges are 10.5 % per annum for the period of delay. Question : What are equalization charges? Answer : Equalisation Charges are additional charges payable by the member who joins the scheme after the due date of payment of Booking Money first installment of the scheme. The rate to be charged is decided by the Governing Body from time to time. At present equalization charges are @ 10.5 % per annum. Question : What is Maintenance Fund ? Answer. Maintenance Fund is a corpus fund created by realizing one time amount from allottees of a scheme according to a percentage of cost of construction as give in the General Rules . This Fund is maintained and operated by respective Residents Welfare Associations. The interest realized from this Fund is used for maintenance of the common services/facilities of the colony. If the amount realized by way of interest is not adequate for maintenance of the colony, the RWAs may collect additional charges from the allottees. Question : What is Depreciation Reserve Fund? Answer. Depreciation Reserve Fund is a corpus fund created by realizing one time amount from allottees of a scheme according to a percentage of cost of construction cost. This Fund is to be used for replacement of heavy capital equipment such as lifts, generators, pumps etc. Interest on this Fund is credited back to the Fund. Amounts from this Fund can be withdrawn only with the consent of IRWO. Question : What is Residents Welfare Association ? Answer. Each colony is required to have a Resident Welfare Association / Society for the purpose of maintenance of the common services / facilities of the colony. Please consult IRWO General Rules for the details regarding the functions and responsibilities of the RWAs.